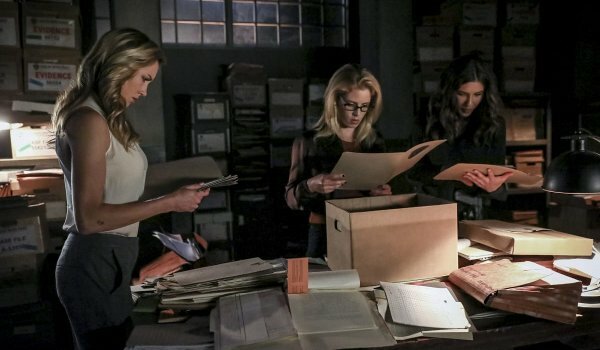 The season's theme of unexpected alliances continues as Oliver (Stephen Amell) finds an old frenemy on Level 2, and Felicity (Emily Bett Rickards) enlists the help of both Laurel (Katie Cassidy) and Dinah (Juliana Harkavy) to discover what off-the-books experiments Dr. Jarrett Parker (Jason E. Kelley) is doing with inmates on a facility the prison doesn't even admit exists. Although the show has really short-changed the character, the return of Talia al Ghul (Lexa Doig) offers some nice prison escape fight sequences and helps give closure to Talia's storyline (and continue to tease a Batman connection to the Arrowverse that The CW has shown no actual interest in ever exploring). The torture Oliver endures also opens a new possible legal recourse to get him out of prison. With no flash-forwards to the dystopian future nor appearances by the new Green Arrow, the episode's B-story instead offers an A.R.G.U.S. operation that puts a reluctant Curtis (Echo Kellum) back into the field. Allowing Diggle (David Ramsey) to talk him into the operation, Curtis not only prevents a terrorist from exploding a nasty bomb but also uncovers some sort of conspiracy within A.R.G.U.S. that no doubt will be absurdly over-complicated and take several episodes to unravel. The episode ends with a cameo from another familiar face as Diaz (Kirk Acevedo) looks to take some revenge half a world away.